Foley, AL is exploding with growth in both the residential and commercial real estate markets. Browse through homes for sale in Foley, Alabama using subdivisions or price and find property details and helpful real estate info for Foley homes for sale on golf courses, water front and all Foley subdivisions. Also, find recently sold Foley homes with actual sold prices and closed dates. Foley, AL homes for sale offer a wide variety of options with rivers, lakes, golf courses and the latest addition was a huge amusement park on the corner of the Baldwin Beach Express and County Rd 20. Real estate prices have steadily increased since the aftermath of Katrina and even though the market didn't suffer much physical damage, the values plummeted and in 2017, prices for homes for sale in Foley, have gotten back to respectable numbers. Some of the more popular spots in Foley include OWA, Glenlakes Golf Club and various inland waterways. We included lots of aerial imagery for Foley and surrounding areas that show the area from up to 400ft. These shots offer great perspective for homes in subdivisions and the areas surrounding the subdivisions. The Baldwin Beach Express has changed Foley for the better and it's much easier to zip around and getting to-and-from the beaches has never been easier. The expressway cuts through Foley about a mile or two North of Hwy 59 in most places. The expressway cuts in to County rd 4 just North of the intracoastal bridge in Gulf Shores and connects I-10 in Loxley. With plans to add to this system, another bridge is being discussed and finalized. One of the soar spots for residents has been the traffic and another route from I-10 to Gulf Shores would surely relieve much, it-not-all, of this heavy traffic. Parts of Foley actually allow for fairly short runs to the Gulf of Mexico. Barber's Marina is out in Northeast Foley or the Elberta area and is pretty close, as the crow flies, to the Gulf of Mexico. The Elberta area is known for their grass and actually helped out with a Super Bowl when rains caused severe flooding. It's only about 10 minutes from downtown Foley which offers numerous restaurants, shopping outlets and entertainment venues. Foley, Alabama is approximately an hour from regional airports in both Mobile, AL and Pensacola, FL. Foley is in the middle of the action and the Gulf Coast's beaches are minutes away. Also, search by subdivision, create a personal search, use our map search or search recently SOLD Foley homes. Abbey Ridge is located a few miles West of Hwy. 59 near the Foley airport. Abbey Ridge is directly in between the entrance to the Foley Beach Express and Hwy. 98. Amelia Woods is a few miles West of Hwy 59 just off of Hwy. 98. The subdivision is just East of the Foley Soccer Park and minutes from downtown Foley. Ashford Park is a couple of miles due West of the Tanger Outlet mall in central Foley, AL. It's minutes from downtown Foley and various shopping, entertainment and dining venues. Ashley Place is approximately 2 miles East of Hwy 59 directly off of Hwy. 98 in central Foley. Ashley Place is pretty much close to all that Foley has to offer, including the beach express for quick travel. Aspen Creek is in rural Foley off of County rd. 12. Aspen Creek is West of Hwy 59 and a 5 to 10 minute drive to downtown Foley and a short drive to the beaches. Audubon Place is off of County rd 12 and 65 and is just in the Foley city limits. Audubon Place is a short drive to downtown Foley and the beaches in Gulf Shores, AL. Azalea Trace is 1 mile South of Hwy 98 and approximately 1/4 of a mile from Hwy. 59. The community is literally in downtown Foley and near most of the Foley area restaurants, shopping and entertainment venues. Bay Forest Estates is a secluded subdivision reached by County rd. 12. The community is on the Northern portion of Wolf Bay and is also near Glen Lakes golf club. Bay Forest Estates has homes on Wolf Bay starting around $600,000. Bella Vista is newly built subdivision off of Keller Rd. Homes start in the 200,000s and require a minimum of 1,400SF. The community sits between Hwy 59 and Foley Beach Express allowing quick access to entertainment, shopping, and beaches. Bon Secour View is a secluded community in rural Foley, AL. The subdivision is at the intersection of County rd. 10 and County rd. 65 and is approximately 2 miles West of Hwy. 59. Briarwood Parke subdivision is approximately 4 miles West of Hwy 59 on the North side of Hwy. 98. Briarwood Parke is near Magnolia Springs and Jesse's restaurant which is a great place to dine. Cambridge Parke is approximately 2 miles North of Hwy. 98 and is literally in the middle of Hwy. 59 and the Foley Beach Express. Its location makes travel easy and it's fairly secluded and the expressway makes a trip to the beaches much quicker. Carnoustie Gardens is in the Glen Lakes golf club which is located approximately 3 - 4 miles East of Hwy 59 off of County rd. 20. Many of the homes in this subdivision are directly on the golf course. Carnoustie Place is in the Glen Lakes community which is located approximately 4 miles East of Hwy. 59 off of County rd. 20. Many of the homes in Carnoustie Place are on the golf course and the subdivision is minutes away from the Foley Beach Express. Collinwood is a small subdivision just East of Hwy. 59 in central Foley, AL. The community is located less than 1 mile South of County rd. 20 and is walking distance to downtown Foley. Cypress Gates subdivision is approximately 2 miles North of Hwy. 98 in Northern Foley. The homes here are very close to Hwy. 59 on the West side and very close to downtown. Erdman is actually in Magnolia Springs which is considered part of Foley, AL. Some of the homes in Erdman are on Fish River and the homes here are approximately 6 miles West of Hwy. 59 and 1 mile North of Hwy. 98. Glen Lakes is basically a broad term for the combined subdivisions of Carnoustie Place and Carnoustie Gardens. Click the thumbnail above to view all of the homes for sale in the Glen Lakes area. Graham Creek Estates is a secluded subdivision reached by County rd. 12. The community is on the Northern portion of Wolf Bay with some of the homes on Wolf Bay. Graham Creek Estates has homes on Wolf Bay and off of the water in a beautiful area of Foley. Liveoak Village is approximately one and a half miles North of Hwy. 98 and just West of Hwy 59 in central Foley. The homes in Liveoak Village is close to downtown Foley and 20 minutes from the beautiful beaches of Gulf Shores and Orange Beach. Hampton Park is a beautiful little subdivision in the southern half of Foley, which is just about twenty minutes from Orange Beach. This is an ideal neighborhood for those with kids, as the sidewalks and quiet streets are ideal for riding bikes, playing with friends, and walking the family dog. Foley is a small town in rural Baldwin County, but it still offers all the comfort and amenities you would expect from a bigger town. Hesse-Styron, located near downtown Foley, is close to local schools, shops, and entertainment venues. Foley is still a small town, but is becoming more and more popular with the development of the Foley Sports Tourism Complex and other projects being built in and around the town. Residents of the Hesse Styron subdivision enjoy a quiet neighborhood and close proximity to the beaches of Gulf Shores and Orange Beach. Hickory Bend homes are in the heart of Foley, near the downtown area. Foley's schools, restaurants, entertainment venues, and shopping areas are all nearby, as is the Foley Beach Express which will take you to nearby Orange Beach. Hickory Bend is a newer subdivision, with houses still being built in 2016. Hickory Bend offers an ideal opportunity to buy a brand new house in one of Coastal Alabama's most charming small towns. Hunters Chase homes are less than half an hour away from the beach communities of Gulf Shores and Orange Beach. Downtown Foley is just a few minutes to the east, as are the city's schools, shopping, and dining areas. This is a rural area, but still within easy driving distance of all the benefits and amenities of a big city, with Pensacola to the east and Mobile to the north. Iberville Square is just south of Foley's downtown area. These are newer homes, many of which are still under construction in 2016. Iberville Square is just a few minutes away from the Foley Beach Express, which makes traveling to the coastal communities of Orange Beach and Gulf Shores much faster than it used to be. This is a small town, but quickly gaining in popularity along with the larger towns of Fairhope and Gulf Shores. Kennedy Park is a small subdivision in South Foley, right next to the Foley Beach Express. Wolf Bay is just a few minutes to the east and Foley's downtown area is just north of Kennedy Park. The larger cities of Pensacola, Florida and Mobile, Alabama are both under an hour away from Foley and offer a wide variety of restaurants, entertainment venues, and shopping outlets. Kuhn Park is very close to the downtown area of Foley, Alabama. This neighborhood is just minutes from the city's schools, restaurants, businesses, and entertainment venues. The Foley Beach Express, completed in 2014, makes travel to the communities of Orange Beach and Gulf Shores on the Gulf of Mexico quick and easy. Lakeview Estates are southeast of Foley's downtown area, just west of Wolf Bay. The subdivision boasts an eclectic mix of newer and older homes in a quiet, rural environment just minutes away from area schools, restaurants, and shopping areas. Lakeview Estates are less than twenty minutes away from Orange Beach and Gulf Shores and can be reached via the nearby Foley Beach Express or those with boats can sail down from Wolf Bay. Leisure Lakes is located just west of Wolf Bay and southeast of Foley's downtown area. Leisure Lakes is only a few minutes away from Pensacola, Florida and about an hour away from Mobile. The Foley Beach Express, completed in 2014, offers this area quick and easy access to the towns of Orange Beach and Gulf Shores. Magnolia Place sits in the Magnolia Springs area, just west of Foley. This subdivision is just off of Highway 98 and is just minutes away from the Foley Beach Express, which an get you down to Orange Beach in less than 20 minutes. There are some houses here that, as of 2016, are still under construction and offer an ideal opportunity to buy a brand new house in this beautiful area. Meadow Run Estates is a newer Foley subdivision located a few minutes south of the downtown area. This beautiful neighborhood boasts amenities such as a clubhouse, tennis court, outdoor community pool, and a fitness facility. Many of these houses are still under construction in 2016. The popular coastal destination of Orange Beach is less than twenty minutes away from Meadow Run Estates. North Pine Place is just north of Foley's downtown area and is close to the Foley Beach Express, which connects the city to the coastal community of Orange Beach. Mobile, Alabama can be reached in about an hour from Foley. North Pine Place is just minutes away from Foley's schools, shopping areas, restaurants, and entertainment venues. Piney Woods is a quiet, secluded community running along Bon Secour River in the south region of Foley. Just south of County Rd 10, the area features multiple riverfront homes with boat access to Mobile Bay leading out to the Gulf of Mexico. Quail Valley is a subdivision off Hwy 98 about 3.5 miles west of Foley's downtown area. These homes are all under 2,000 square feet and are perfect for new families or a first-home buyer. This community is close to area schools, businesses, and restaurants. River Trace sits just a few minutes away from the Foley's downtown area and less than twenty minutes away from the white-sand beaches of the Gulf of Mexico in Orange Beach. This neighborhood has a lot of newer houses built in the mid-2000s. The Foley area is growing quickly, as are the other Coastal Alabama cities. Riverside Arbor Walk sits between Bon Secour and Foley in a quiet, rural area of South Baldwin County. The two regional airports in Mobile, Alabama and Pensacola, Florida are easily reached from Riverside Arbor Walk, as are the beach towns of Gulf Shores and Orange Beach. Foley's local schools, entertainment venues, shopping areas, and restaurants, are all just minutes away from the Riverside Arbor Walk subdivision. Riverwood subdivision is a quiet residential neighborhood covered with mature trees and native landscaping. Located along Bon Secour River, many of these homes have deeded access to Bon Secour River and private boat docks and fishing piers. The Rosetta subdivision is located just off of Highway 59 near downtown Foley. The new Foley Beach Express brings residents of Foley to the popular destination of Orange Beach in about 20 minutes. Rosetta is close to Foley's schools, restaurants, shopping areas, and entertainment venues. This is a small town that is quickly growing into a popular choice for those looking to live close to the beaches without having to live in the more crowded areas of Gulf Shores and Orange Beach. Sea Pines at Bon Secour is a newer neighborhood located in Foley, AL just off County Rd 10. Made up of two and three bedroom residences, the gated community features resort-style amenities including an outdoor pool, clubhouse, exercise facility, and game room. Sherwood is a beautiful residential community located off of County Rd 20 in central Foley. This family-friendly neighborhood features new craftsman style homes ranging from 1,800 to 2,200 square feet in size. Sherwood is minutes from downtown Foley, restaurants, and popular shopping outlets. Serene Cove is a small residential community located off of County Rd 12 in southern Foley. This quiet neighborhood is made up of less than 10 single-story brick homes and features a large freshwater lake with a community fish pier. Sunset is a community set in the rural part of Foley west of Hwy 59. Foley's downtown district, restaurants, businesses, and municipal airport is a just short drive from this neighborhood. Sunset Shores sits right on the shore of Bon Secour Bay, a few minutes west of the downtown Foley area. Those who have boats can easily sail north to Mobile Bay or south to the Gulf of Mexico and Fort Morgan area. Sunset Shores is not far from the Eastern Shore area, with major towns like Fairhope and Spanish Fort offering numerous golf courses in addition to a variety of shops and restaurants. Mobile, Alabama is easy to reach from Sunset Shores. Sweet Gum Village sits between Foley and Magnolia Springs area, just minutes from Foley's downtown area. Orange Beach is less than half an hour away and much easier to reach than before thanks to the recent completion of the Foley Beach Express. Sweet Gum Village is close to area schools, restaurants, and entertainment venues. Thiem is a secluded, wooded community running along Bon Secour River in southern Foley. The neighborhood is 15 minutes from both Downtown Foley and from Gulf Shores beaches. Twin Bridge Estates sit near the northern area of Soldier's Creek Golf Club, just minutes from the downtown area of Foley. The Foley Beach Express is just a few minutes away and makes travel to the coastal community of Orange Beach easier than ever. Twin Bridge Estates is in a rural area with beautiful wooded lots and a laidback atmosphere, but is still only minutes away from numerous restaurants, schools, shopping outlets, and entertainment venues. Walker Grove is a neighborhood inside the downtown district of Foley. The subdivision is right off Hwy 98 and about 1 mile east of Hwy 59. Residents can walk to downtown shops, restaurants, and to popular events held by Heritage Park. Waverly Manor is located in South Foley and minutes from the small fishing community of Bon Secour. Gulf Shores is only a few minutes south of Waverly Manor and both the I-10 and connected Foley Beach Express makes travel around Coastal Alabama quick and easy. This is a rural community and many houses have big, wooded lots and a good deal of privacy, but residents still enjoy the convenience of being within minutes from numerous cities that host a variety of shopping outlets, restaurants, and entertainment venues. Wolf Bay Estates homes are just south of downtown Foley in the small town of Miflin. With both houses and lots on the market, this waterfront community is sure to be a hit with nature lovers looking to live close to the Gulf of Mexico while enjoying all the benefits of living in a small, rural area. The Wolf Bay Estates sit close to the Foley Beach Express, making travel down to Orange Beach and other nearby towns quick and easy. Weeks Bay is an area reached by various means and is a smaller body of water with numerous types of real estate and properties. The bay is in between Point Clear and Bon Secour. Weeks D W is a secluded community in Foley about 10 miles west of Hwy 59. Near Weeks Bay Reserve, most of the area is heavily wooded and features homes on large lots with access to Mobile Bay. Wenzel's Oak River is a small community along Bon Secour with many riverfront homes. Most of these homes are from the 60-70s era on sizable lots with dense mature trees. Located in the southern region of Foley, Gulf Shores beaches are about 15 minutes away. Woodmont is located in the heart of Foley, just north of the downtown area. The nearby Foley Beach Express makes travel down to Orange Beach and Gulf Shores quick and easy. Residents of Woodmont are just minutes from Foley's schools, restaurants, parks, and shopping areas. Woodmont is also close to the Glen Lakes Golf Course and a number of other golf courses are just a few minutes north of Foley. There are a lot of new homes in Woodmont and it is an ideal choice for those who want to settle down in a charming little community near the Gulf of Mexico. Wynwood is located a few miles north of Foley's downtown district and just west of Highway 59. This community is made up of smaller homes under 2,000 square feet and make ideal residences for new families or for first time home buyers. Local schools, restaurants, shopping, and entertainment centers like OWA are a short drive from the neighborhood. Residents can reach the city of Orange Beach in just 20 minutes when traveling on the Foley Beach Express. Park Avenue condominiums is located just behind the Foley YMCA and Wal Mart in central Foley. Ashford Park subdivision is just West of Park Place and numerous back roads and short-cuts help to quickly traverse Foley. Foley is part of Baldwin County, which is home to some of the best schools in the state of Alabama. Foley has local elementary, middle, and high schools that all have good ratings. Foley is also home to Fortis College, which has campuses all over the country. As is to be expected from Alabama's coastal cities, the weather in Foley is usually hot during the summer and warm all winter. There is an above average amount of rainfall in Foley and the area is vulnerable to hurricanes and tropical storms due to its close proximity to the Gulf of Mexico. However, these are the only potentially major disasters residents really have to worry about. Crime in Foley, both violent and property, are a little higher than the US average, but still lower than most big cities. There are a number of different subdivisions in Foley, with both newer and older homes. In some areas, houses are still under construction and potential residents have the opportunity to buy one of the newest houses in the area. Foley is projected to keep growing alongside the nearby cities of Gulf Shores and Orange Beach. The recently built Foley Sports Tourism Complex has put this little town at the center of a lot of attention as more and more sports clubs and teams choose to come to Foley for their competitions. Although not very common, if you're looking for foreclosure info, Check out FOLEY, AL FORECLOSURE LISTINGS FOR SALE. Quickly find the closed price and closed date for homes in Foley using the links below to skip directly to a Foley subdivision. Also, we have links to view recently SOLD homes in a particular subdivision on all of our condo and subdivision sales pages, so while browsing homes for sale, quickly find the most recently sold homes in a particular area. ReadAshford Park is a couple of miles due West of the Tanger Outlet mall in central Foley, AL. It's minutes from downtown Foley and various shopping, entertainment and dining venues. ReadAshley Place is approximately 2 miles East of Hwy 59 directly off of Hwy. 98 in central Foley. Ashley Place is close to Foley restaurants and shopping and near the Beach Express for quick travel. ReadAspen Creek is located in rural Foley off of County Road 12. The community is West of Hwy 59 and a 5 - 10 minute drive to downtown Foley and a short drive to the beaches. ReadAzalea Trace is 1 mile South of Hwy 98 and approximately 1/4 of a mile from Hwy. 59. The community is minutes from downtown Foley and near most of the Foley area restaurants, shopping and entertainment venues. ReadBay Forest Estates is a secluded subdivision reached by County Rd 12. The community is on the Northern portion of Wolf Bay and is close to Glen Lakes golf club. Bay Forest Estates has homes on Wolf Bay starting around $500,000. This subdivision is about 25 minutes from Gulf coast beaches. ReadBella Vista is a newly-built subdivision off Keller Rd in the southern region of Foley, Alabama. Prices for homes in Bella Vista begin in the 200,000s and minimum size home is 1,400SF. The community is close to Foley attractions including Tanger Outlets and OWA park and approximately 15 minutes from public beaches. ReadCambridge Parke is a secluded subdivision just off County Rd 28 and is central to Hwy. 59 and the Foley Beach Express. Its location makes travel and the close by expressway makes a trip to the beaches much quicker. ReadCarnoustie Place is in the Glen Lakes community located approximately 4 miles East of Hwy. 59 off of County Rd. 20. Homes in Carnoustie Place start in the mid $200s and many are on the golf course. The subdivision is minutes away from the Foley Beach Express and a 20 minute drive to public beaches. ReadCollinwood is a small subdivision just East of Hwy. 59 in central Foley, AL. The community is located less than 1 mile South of County Rd. 20 and is walking distance to downtown Foley. ReadCooper's Landing is a tucked-away community off of County Rd 10 and just west of Hwy 59. The neighborhood is close to Bon Secour, a sleepy fishing town. The gulf beaches are roughly 15 minutes south of Cooper's Landing. ReadCopperwood subdivision is located right off Hwy 98 and just outside downtown Foley. Prices for homes begin at $130,000 with home sizes ranging from approximately 1,300 to 1,800 square feet. The family-friend community is minutes from many attractions including the OWA park and gulf coast beaches. ReadCottages on the Green is located right of County Rd 12 in the region of Foley. This quaint community offers nice amenities including a clubhouse, outdoor pool, exercise, center, and a gated entrance. Just minutes from Hwy 59 and the Foley Beach Express, Cottages on the Green is quickly accessible to restaurants, shopping, golf courses and a 20 minute drive to beaches. ReadCrown Walk is a peaceful, family-friendly subdivision just off County Rd 12. The subdivision is 1 mile west of Hwy 59 providing quick access to local restaurants, shopping, and entertainment. It takes less than 20 minutes to reach the public beaches from Crown Walk. ReadFernwood Heights subdivision is located right off Hwy 98 and is nestled between the cities of Foley and Elberta. The private wooded community features two parks and has access to Sandy Creek making it ideal for kayakers. Fernwood Heights is a few minutes from the Foley Beach Express making it easy to travel to restaurants, entertainment venues, and public beaches. ReadFulton Place is a recently developed subdivision with new homes or homes currently under construction. The quiet community is made up of brick patio homes starting from the mid $100,000s. Located right of County Rd 12, the neighborhood is just minutes from the Beach Express allowing for easy travel whether commuting to nearby cities or heading south to the public beaches. ReadGlenLakes is a large golf community centered between County Rd 20 and County Rd 12. The community offers existing homes and new construction along the fairways and lakes of GlenLakes Golf Course.The development offers many great amenities including a clubhouse, outdoor pool, BBQ area, and family park. Residents can visit Muriel Lake and fish for bass off the pier or watch for ospreys flying overhead. ReadGreystone Farms is located in the southern region of Foley just off County Rd 12 S. Ideal for kayakers and boaters, the community is a few minutes from both Magnolia Springs and Bon Secour Bay. The community features newly built homes and some currently under construction. Hwy 59 is 3.5 miles to the east and provides easy trips to local restaurants, shopping malls, and entertainment venues. ReadHidden Lakes is a family-friendly community located right off County Rd 10. The subdivision boasts great amenities including a large outdoor pool, pavilion with grill and picnic area BBQ area, tennis courts, and a fully stocked lake. 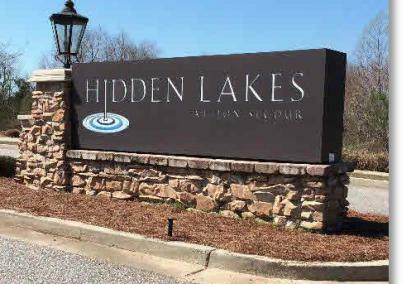 Hidden Lakes is three miles west of Hwy 59 and minutes from restaurants, shopping centers, golf courses, and public beaches. ReadIberville Square is located in the heart of Foley right off S. Juniper Street. These newer homes are ideal for smaller families with floor plans ranging from 1,200 to 1,800 square feet. The neighborhood is just a few blocks from The Tanger Outlets and Foley Sports Complex. Take the friends and family to nearby OWA amusement park for a thrilling rollercoaster ride or catch a concert at The Wharf. Residents can take Hwy 59 or the Beach Express to reach either Gulf Shores or Orange Beach. ReadJames A. Wright is a community tucked-away in the heart of Foley. The area is filled with beautiful mature trees and offers a mix of new and old homes. James A. Wright is central to a number of schools, restaurants, shopping, and golf courses. Residents can travel south on the Foley Beach Express to visit the sandy beaches of Orange Beach or Gulf Shores. ReadKennedy Park is a small subdivision in the south end of Foley and just off the Foley Beach Express. The neighborhood is close to GlenLakes golf course and minutes from Wolf Bay, a popular kayaking spot. Kennedy Park is a short drive to major shopping centers such as the Tanger Outlets and close to many other attractions. The Expressway provides a quick 20 minute drive for those wanting to spend the day at the beach. ReadKuhn Park is an older community with the majority of homes built in the 1970s. Located in the charming downtown district of Foley, the neighborhood is fringed with mature oaks and pecan trees. Many of the lots are oversized allowing enough space for those who want to build a workshop or swimming pool. Kuhn Park is minutes from Foley schools, shopping, and restaurants. ReadLakeview Estates is a division of the GlenLakes golf course community. Nestled between CR 20 & CR 12, the subdivision features homes along the fairways with some backing up to the lake. Both new construction and older homes make up this quiet, exclusive neighborhood. Lakeview Estates is close to both Hwy 59 and Foley Beach Express providing quick access to a variety of restaurants, shopping complexes, and entertainment venues. ReadLeisure Lakes is located just west of Wolf Bay and southeast of Foley's downtown area. The majority of the homes in this neighborhood are less than 2,000SF with some homes directly on the lake and others offering lake views. Residents can enjoy the community's amenities including a clubhouse, large outdoor pool, gazebo, and lakeside pier. Leisure Lakes is minutes from the Foley Beach Express making an easy and fast trip to the towns of Orange Beach and Gulf Shores. ReadMagnolia Gardens is a small charming subdivision nestled in the Foley's downtown district. Located just off N Hickory St, the community consists of one street loop allowing for a quaint and safe setting for neighborhood kids to play and ride bikes. Magnolia Gardens is conveniently nearby to schools, medical offices, shopping and restaurants. Families can visit the public beaches and the popular Gulf Shores Hangout in approximately 25 minutes. ReadMagnolia Place subdivision is located just off of Hwy 98 in the rural area of Magnolia Springs, AL. Homes in this neighborhood were built within the past few years, in addition to brand new homes from a local builder. The quiet community is perfect for families and retirees that prefer to be away from the hustle and bustle of the city. Magnolia Place is approximately 25 - 30 minutes from both Gulf Shores and Orange Beach. ReadThe charming town of Magnolia Springs is centered between Fairhope and Foley. This quaint community is located on Magnolia River with many homes directly on the water. Magnolia Springs is the only place in the US where residents receive their mail by river route. Homes are nestled among historic live oaks blanketed with Spanish moss. Town landmarks include Jesse's, a fine-dining restaurant known for their "whisky steak" and the "Cold Hole" a natural cold water spring popular among locals. ReadMarem Place is a newer subdivision just off of CR 49 in the rural part of Foley. The neighborhood is still undergoing new construction by a local homebuilder. Marem Place is perfect for those who prefer a quiet setting miles away from traffic and busy highways. ReadMeadow Run Estates is a newer Foley subdivision located a few minutes south of the downtown area. This beautiful neighborhood boasts great amenities such as a clubhouse, tennis court, outdoor community pool, and a fitness facility. Many of these houses are newly built with some still under construction. Families can reach Orange Beach in less than twenty minutes from Meadow Run Estates. ReadOak Wood Estates is a secluded wooded community approximately 4.5 miles west of Hwy 59. Located in the rural part of Foley, Oak Wood Estates is perfect for those who prefer larger, estate-size properties and privacy among neighbors. The beach towns of Gulf Shores and Orange Beach can be reached within 30 minutes of Oak Wood Estates. ReadParish Lakes is a family-family community located right off Juniper Street in Foley, Alabama. The subdivision was developed by a national homebuilder and prices of homes average in the mid 200,000s. Some of these homes are still under construction. Parish Lakes is in an ideal location and just minutes from the heart of Foley and near shopping centers, schools, and restaurants. Gulf coast beaches are approximately a 25 minute drive from Parish Lakes. ReadPebble Creek is a subdivision off of S Hickory Street & County Rd 12. The neighborhood provides lighted streets for walkers and runners, and homes boast great curb appeal with well-manicured yards. Pebble Creek is just minutes away from Wal-Mart, Tanger Outlets and other shopping centers. Orange Beach and Gulf Shores is approximately 20 - 25 minutes away. ReadPiney Woods is a beautiful, quiet subdivision bordering Bon Secour River. The community suits nature lovers with boat access to Mobile Bay and minutes from Bon Secour Wildlife Refuge. Piney Woods is minutes from Hwy 59, and near restaurants, golf courses, and shopping centers. It is approximately a 20 minute drive to the beaches of the Gulf of Mexico. ReadPlantation at Magnolia River is family-friendly neighborhood located right of Hwy 98 between Fairhope and Foley. The subdivision features sidewalks, street lamps and homes have excellent curb appeal with landscaped yards. Most homes have backyards large enough for a workshop or swimming pool. The community is a few miles from downtown Foley and close to schools, shopping, and restaurants. ReadRiver Trace is a charming residence right off S Hickory St and just outside Foley's downtown district. This neighborhood has a lot of newer houses built in the mid-2000s and prices range from $150K to $200K. River Trace is a great family-friendly community and residents can enjoy a nice evening walk on the well-lit streets. The area is close to schools, restaurants and is less than twenty minutes from public beaches of Gulf Shores and Orange Beach. ReadRivers Edge is an upcoming subdivision just off County Rd 12 and is less than a mile from Hwy 59. Surrounded by plenty of trees, the neighborhood offers lots ranging from a quarter acre to well over 1 acre. Rivers Edge is the perfect place to build your dream home and is a short drive to many attractions such as OWA park, Tanger Outlets, and a number of golf courses. Take the family on a 15 minute trip to the powdery beaches of Gulf Shores. ReadRiverside Arbor Walk is a fully developed subdivision nestled between downtown Foley and Bon Secour, AL. This quaint neighborhood offers a perfect setting for kids to play and ride their bikes. Price points for these homes range from the mid $100K's to low $200K's. Foley's local schools, entertainment venues, shopping malls, and restaurants, are all just minutes away from the Riverside Arbor Walk subdivision. ReadRiverwood is a quiet neighborhood off County Rd 10 in the southern region of Foley. Each home is granted a deeded boat lot on Bon Secour River with the option to add a boat slip if desired. The area has direct access to Mobile Bay where boaters can fish for speckled trout or watch beautiful sunsets. Kayakers can paddle their way to Plash Island and watch ospreys flying overhead. Riverwood is just minutes away from the beaches in Gulf Shores and shopping/restaurants in downtown Foley. ReadSandy Creek III is located just east of downtown Foley and is just off Hwy 98. The community is perfect for nature lovers who want to explore the deep woods, camp, or swim in the nearby creek. Buyers can build their dream home on several acres of untouched land. Sandy Creek III is conveniently close to the Foley Express allowing for quick access to I-10 to reach the cities of Mobile and Pensacola or or south to Gulf Shores and Orange Beach. ReadSea Pines at Bon Secour is an exclusive gated community in the south of Foley just off County Rd 10. The new development features great amenities including a clubhouse, fitness center, & outdoor heated pool. Less than a mile from Hwy 59, the neighborhood is close to many restaurants, golf courses, and entertainment venues including The Hangout and The Wharf. The beaches of Gulf Shores are just a 15 minute trip from Sea Pines at Bon Secour. Although Foley is the closest to Alabama beach towns Gulf Shores and Orange Beach, several other great communities are close by including Fairhope, Daphne, and Spanish Fort. These municipalities make up the Eastern Shore located along the eastern side of Mobile Bay. Fairhope is a charming, scenic locale that exudes southern charm and boasts an active arts community. When most people hear of Fairhope, they think of the beautiful scenery along Mobile Bay and the gorgeous live oaks blanketed with Spanish moss which often serves as a popular, picturesque backdrop among local photographers. Of course, we also think of the iconic Fairhope clock and colorful flower-lined streets of downtown Fairhope offering great shopping, wonderful restaurants as well as a great venue for many annual events. Fairhope is a great place for raising families and is known for its fantastic school system considered one of the top districts in Baldwin County. The area offers a great selection of neighborhoods including newly developed subdivisions, golf course communities, gorgeous waterfront residences, and many others. Spanish Fort and Daphne are both north Fairhope and are great family-friendly communities and offer top-ranking schools. These cities have experienced accelerated growth over the last decade with a significant increase in commercial construction and residential developments. Learn more about available homes in Baldwin County by using our search features and find homes in specific subdivisions or browse for homes by price range, square footage size, or number of bedrooms & baths. Our site also provides recently sold prices and closed dates of all Baldwin County homes and condos allowing our users to research property values. Please feel free to contact us at info@condoinvestment.com or send us a message on our chat feature located at the bottom right of the page.